What do you get when Japanese architecture meets Fred Flintstone ceramics? Bold, organic, fresh looking pots. Whether you are a beginner touching clay for the first time or advanced and wanting to take your work to another level, this workshop will give you a new perspective on how to approach clay from a sculptural point of view, while using a potter’s wheel to get forms for altering. Shadow May will demonstrate how to use the wheel as a tool to achieve a form, and incorporate basic hand building and slab techniques to reveal a unique, fresh look in your work. He will throw out slabs by hand and learn how to fold, bend and encapsulate air within them for altering. He will show how to use minimal tools to accent and manipulate your work for a primitive yet sophisticated look. Discussion will include techniques that incorporate wood/soda techniques into firing in an electric kiln. For two days we will watch Shadow May make his work and hear his story. 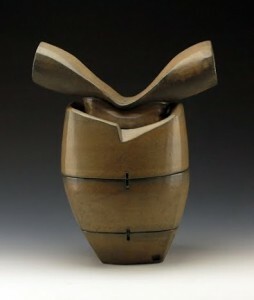 He takes functional pots beyond conventional limits where they stand alone to become visual art. His sculpture has a life and breath of its own, and his journey as a potter/artist is as unique as his work. His organic approach to working will help the tight potter loosen up and give the loose potter a new perspective. This workshop has the potential to send many of us down new creative paths where we approach new ideas with a “what if” excitement!